The holiday season has arrived-- and so has that big magnifying glass!! Every holiday season is a mixed bag of emotions. It is easy for us to be "over sensitive" to life around us. This past week, I encountered an abundance of unusually grumpy people. It is important to remember that that this is a sensitive time of the year for many other people as well. My first Thanksgiving and Christmas without Logan are still so painfully memorable... for someone who was in a fog. Those who know me well know that I grieve many other losses during the holidays. The loss of your child is the "Primary Loss." In my situation, it is the "Secondary Losses" that I personally grieve now. In speaking with many of you recently, I have noticed that many are feeling "anger" or overall agitation now. Like I have said before, NONE of these feelings are "Normal", but all of what we are feeling is "Natural." When the empty chair is ignored.... It is hurtful but natural. I believe that it is common for the BIG invisible elephant in the room to sit in the middle of the activities. Remember-- Often people are fearful of mentioning the absence and loss of our child (every day but especially on a holiday). This makes many of us angry at times! Why wouldn't it make us angry? Know that this is a time of tremendous and conflicting emotions. We are oversensitive to people's actions and words right now. Protect yourself by taking care of YOU and your family. One of my friends who lost a child several years ago - their family went to the movies on Christmas. "Some things you cannot do again." It was too painful to "go thru the motions" for them... but now that there are grandchildren, they are trying Christmas again. This is a goal of mine one day as well. Ps-- I'm planning a weekend retreat in January. Message me if you are interested. Labels: Holiday grief family grief. Anger. One of the things that I believe is helpful is to write "the story." The task seems daunting when you think about the amount of additional emotion that it takes to write the story.... Because it is often haunting. Truly-- It is something that you do not want to remember but you also do not want to ever forget. The "why's", "the what if's" and other personal survivor self torture is miserable. So, type up the story and email it to yourself-- this allows you to begin to "let go" of some of the details --- so you do not need to focus on them constantly. When writing, think about your senses. Our senses hold the key to very powerful memories. What did the day FEEL like? What did you smell? What did you taste? What noises happened during the story? Our senses provide a memory that is unique to the experience and can later unexpectedly trigger anxiety. Also-- write down the thoughts that you cannot really say out loud. In my situation, I had my own personal fight with God -- cursed and said things that were flying through my mind at times. Let it go. Years ago, I created a free gmail email to use as my journal and "brain escape". Whenever I was feeling anxious and those repetitive angry and negative thoughts spun through my head, I wrote them down and emailed them to my email journal. I sent them to the big computer in the sky. In part, slowly dismissing the irrational portions of my thinking. Also-- I made a personal decision to not read these emails for almost a year. When I did read them, I was surprised to see how far I had moved. It seemed like movement occurred in inches, but after reading my private earlier thoughts, I realized that I had made more progress than I had given myself credit. Recently, a patient mentioned to me that his son suddenly died in 2009. As his wife quietly sat next to him, I was surprised to hear HIM talking about it. He spoke of anger and regret and the "if only's". This surprised me because I notice that the mamas often tend to be more verbal. He had become very comfortable talking about his sons unexpected death. I asked this man, "what specifically helped you begin to move forward and heal?" This man said "Tuesday Mornings with the Dad's." I thought he was referring to the book "Tuesday mornings with morrie" I was wrong. This was new information for me so I asked him to elaborate. He explained that this book changed his life. He explained that he later began to meet personally with the Indianapolis based group. 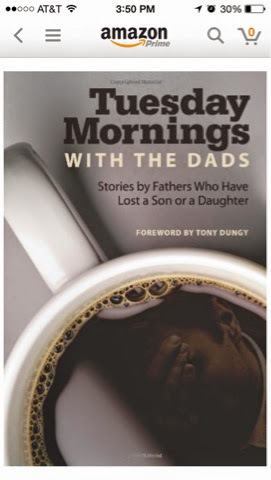 "Tuesday mornings with the dad's" is a group of men who meet and support each other after they have lost a son or a daughter. After a few years of meeting, the group of men decided to put together a book of their stories-- from a fathers perspective. They have the specific purpose of supporting each other-- men and their grief. In the foreward of Tuesday Mornings With The Dad's, Tony writes about his own personal interactions with the men who authored this book. As many of you know, my son Logan loved the Indianapolis Colts. Three weeks after the death of Logan in 2007, the coach of the colts, Tony Dungy, called my husbands cell phone. Tony desired to offer support in his grief-- from one father to another. Tony also sent his new book with a personal note and a scripture written in the front of the book (it later became a best seller). Most importantly, he left his phone number. He firmly believes that supporting each other-- in his case, one dad to another-- is critical to our healing. I now understand that this was an exceptionally kind action, considering it was only 18 months after losing his own son. If you are a man who is enduring the loss of a child, I encourage you to read this book. Why should you read "the stories" of their personal trauma and tragedies?! This answer is big, so pay attention! When listening to others who have experienced a similar path, you will often feel a sense of connectivity... This is when the lightbulb moment CAN occur!!! At this point we can have the actual belief that there really IS hope for a different future. These men have endured trauma and tragedies and are now living their LIVES again.... After redefining normal. Just like my patient who lost his son, you should realize that there really CAN be life on the other side of the silence and darkness of grief. The darkness and pain can be resolved-- only when you do your "grief work". There truly IS hope for grieving fathers... And mothers... And families.